Christmas priorities at St James’s Church: Israel security wall stunt cost £30,000! Take a look at the above photo. That is what £30,000 looks like. That is the cost of St James’s Church’s replica of Israel’s security wall according to St James’s churchwarden Jo Hines. Hines said the money was all privately raised, presumably from the likes of vicious anti-Israel charity War On Want, Amos Trust, Holy Land Trust, Interpal, Jews For Justice For Palestinians, Israeli Committee Against House Demolitions, P21 Gallery, Tipping Point North South, Zaytoun CIC all of whom are “associated with” Bethlehem Unwrapped. 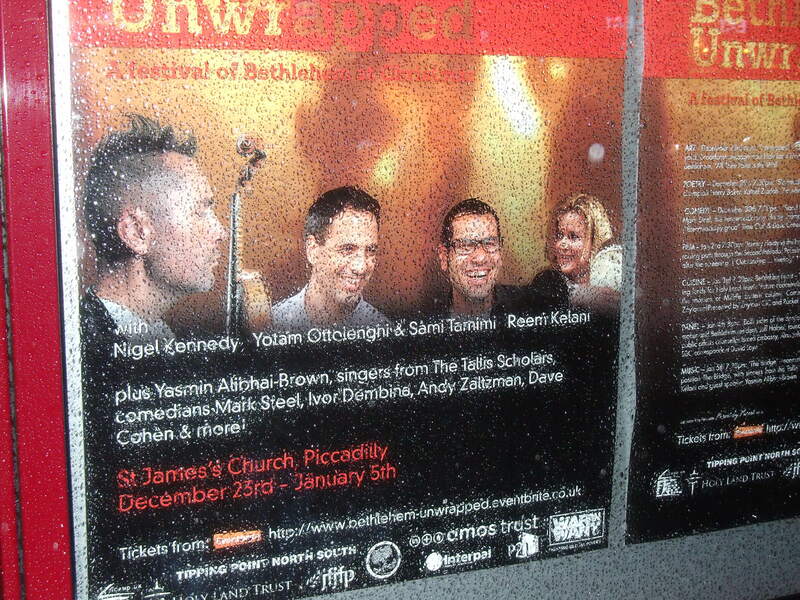 Last night it was the turn of Jewish comedians Ivor Dembina, Dave Cohen and Andy Zaltzman to go on stage for Bethlehem Unwrapped, which is pretty ironic seeing as one of their audience members was Jane Green, probably a pseudonym, who is a notorious Holocaust mocker. As she went in to the church last night I asked her what she thought of the Holocaust to which she replied “What Holocaust”. Then, of course, there is this clip of a discussion outside St James’s Church where a supporter of Israel is called “a frigging Jew” (see from 4 mins. 15 secs.). All pretty disturbing stuff especially in the week of Nicolas Anelka’s alleged reverse Nazi salute. When I put it to Hines that the £30,000 could have been better spent feeding the homeless and heating the elderly she responded that that argument could also be made in relation to statues and that there are 20 or so homeless people sleeping in St James’s Church at night. Imagine had St James’s Church’s courtyard, where the replica wall stands, been made into a structure for the 12 days where even more people could sleep, be fed and be kept warm. Churches, I thought, were in the business of looking after the poor and caring for the elderly. After the 12 days of Christmas are over the replica wall is due to be taken down. That amounts to a cost of £2,500 a day. At least a statue usually stays up for the long-term so over time its daily cost is minimal. So what is St James’s Church’s replica wall going to achieve? 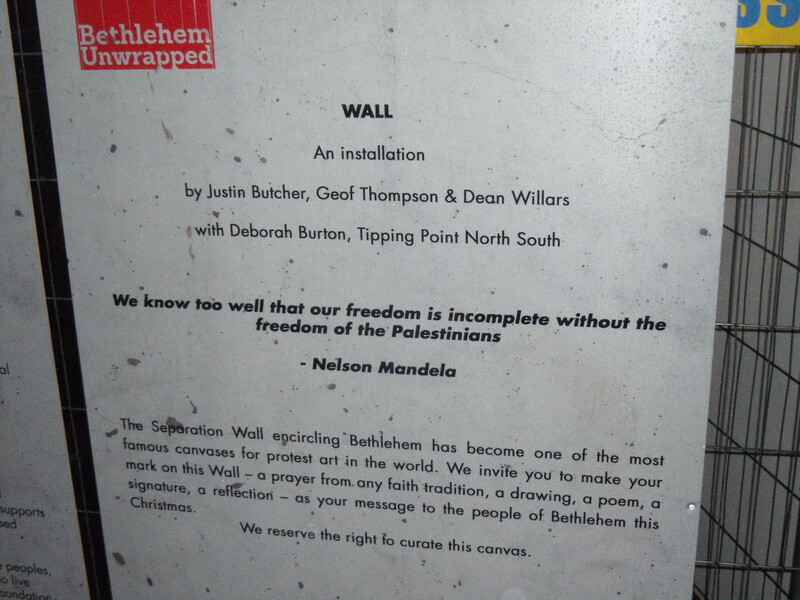 St James’s Church states “All net proceeds to the ‘Future Peacemakers Appeal’, Holy Land Trust, Bethlehem.” I’d be amazed if there are any “net proceeds” when you take into account the £30,000 cost of the replica wall. Admittedly, chef Yotam Ottolenghi’s friday night £125/head “Bethlehem Feast” could make inroads into the £30,000. 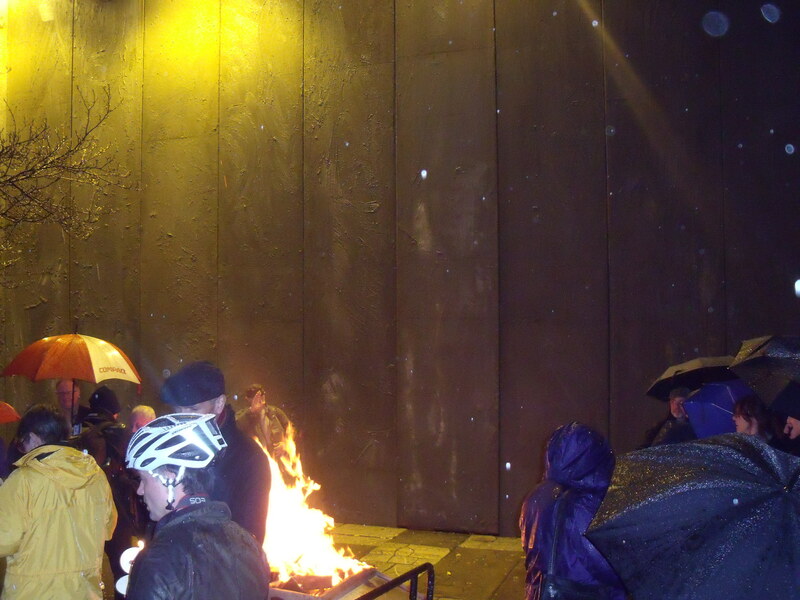 For British Jews the replica wall and Bethlehem Unwrapped are a disaster. I agree with Melanie Phillips when she states that its inevitable effect will be “to incite hatred against Israel and all who support its defence”, which means even more vigilance at synagogues, Jewish schools and Jewish events. Some will benefit though. Ottolenghi and his chef partner Sami Tamimi and Dembina, Zaltzman and Cohen will have had their faces and names plastered all over the gates of the Church which looks out onto one of the busiest roads in London. Not forgetting Justin Butcher, Geof Thompson, Dean Willars and Deborah Burton who all helped to design the replica wall (see below). In the end the £30,000 cost of the wall could have been donated to help those that St James’s Church, Piccadilly, really claims to care for: the people of Bethlehem. You are right the money should have been given to the poor. However to link up the guy calling a supporter a Jew instead of a Zionist with Annelkas fascist salute is pure bunkum. There is no wonder that people make mistakes ..on this site the words ” Jewish state ” and ” Israel ” seem to be interchangeable dependent on whether Israel is the aggressor or the Jewish state is under attack . This is hyperbolic nonsense . The word disaster is overkill and lazy . Some Israel supporters got shouted at… a disaster is when your community looks like a war zone , your men are in prison and people say it is your fault. I think calling someone “a friggin Jew” outside a Church festival is as disturbing as Anelka’s salute. At least Anelka has been brought down a few pegs so far. Will the Church apologise for provoking the “friggin Jew” insult? As for “disaster” there is a scale of disasters. We don’t know the scale of this one yet. What brainwashing unleashed Mohammed Merah in Toulouse, for example? We don’t yet know the scale of what St James has done. But, for starters, seeing someone called “a friggin Jew” isn’t a good start, is it? You are deliberately misunderstanding me . You know I meant present day London . You are quoting the most ghastly thing that happened across Europe over the past few years . You are comparing a psychotic child murderer to a goaded, infuriated and out smarted academic on a political protest . Whilst you continue to see any sort of protest against Israel in such extremist and murderous terms you will not find a moderate who will listen and why would they ? Fortunately, not everyone chooses to bury his / her head in the sand. There was also the Lee Rigby case in London earlier this year. Israel itself is replete with examples of individuals who suddenly committed murder to obtain a better image within Arab society. The “friggin’ Jew” anti-Semite isn’t far from Merah and Adebolajo isn’t that great. Nowadays, there is only one religion for which many adherents readily commit murder in the name of the religion. Richard, the brainwashing began long ago for many of these people and it’s too late to help them. You are doing good work by undermining that thinking and it will register with the more intelligent, open-minded readers, which, of course excludes website. It isn’t pure bunkum, website/berchmans. I cannot expect you to recognise this, but it is part of an accretion of anti-Jewish feeling, put in train by excuse makers like you, and Pal propaganda which does not discriminate between Zionist and Jew and hates both equally. It’s growing and threatening to consume us all and those who do not act against it are complicit in it. What might have happened had the pro-Zionist speaker in the video answered, “.. and you’re a friggin’ Muslim…”? Weasel …pure weasel speak. Luckily I can speak a little weasel and I see you interchange “Jew” and “”Zionist like the guy in the video. I repeat my main point ..if you folk mix the terms why do you expect others not to? Our resident lying creep likes to select Jews. Richard kol ha kavod. The true nature of this farce can be seen on your blog where the supporters of this hate fest (carol, christiansforzionwatch) openly and clearly show themselves as they are – neo-Nazis, demonstrating almost every classical tropes of Christian/European antisemitism. I only hope that the majority of their Christian coreligionists will kick them out from the church. (but I wouldn’t hold my breath knowing the past behavior of the CoE). Yes. Kol Ha Kavod, Richard. You are a courageous man doing a vital job. More power to your elbow. This is a disgusting use of the Christmas holiday. There seems to be there a lot Christian guilt over the Holocaust. This stunt, erecting a replica of a wall, which in Israel (the Jewish State, by the way) is actually mostly a fence installed to save lives, and that has saved countless lives, and to impugn to that benign, preventative, peaceful effort something altogether different and nefarious is in line with some traditional church teachings vis a vis the Jews, i.e., it’s anti-Semitic. That’s the bottom line. Thank you, again, for all the work you do to expose such shenanigans Richard. I was brought up a Christian but we had no guilt whatsoever . Coming from people who were first to sign up to fight Hitler meant that whilst we hated Nazis we saw their ” Christianity ” as others saw the “Christians ” of the Inquisition. I am sure there are ghastly extremists in every religion …yes even that one. Coming from people who were first to sign up to fight Hitler ? Care to explain. Sure . For all the sneering, the pointing ,the lies on this site about the Brits one thing cannot be argued with . The Brits detained him whilst the Russians got ready .Then we shortened the war by two years through Bletchly Park. My people did this. My relatives ..every guy fought …we lost many . Then I come to this site to find that I am a Jew Hating Nazi lover. You didn;t fight to defend the Jews . YOu faught to defend yourself so it has nothing to with the Jews. Yes, the Brits and Stalin standing shoulder to should, all alone, in the fight for human dignity and freedom. …and it’s only January 2. Maybe you should have had just a little. Oh dear! The amount of column-inches you are devoting to this shows how the truth can be scarey. We don’t want this to get out, do we? Tough. It’s done. Deal with it. The truth about Natzie is a quite simple one. Deal with what? the fact that you people lie and refuse to accept the fact that the wall is life saving. YOu don;t like the fact? Tough . It is saving Israeli life . Deal with it. It’s quite funny/ironic/droll when people start to quote UN resolutions or International Law as if they have some sort of clue what they are talking about and as if the august institutions they defer to are oracles of truth that actually have some sort of unbiased credibility.